I wanted an efficient, modest, contemporary and quiet running yacht for cruising the Intra coastal waterway, Chesapeake Bay, Bahamas and the Great Lakes in my retirement. The boat would require the ability to safely cross several hundred miles of open sea at a good cruising speed. Designed by Roger Hill from New Zealand, Ion fits this description nicely. The 34′ power catamaran cruises nicely at 15 knots, turning 3,600 rpm and consuming about 5 gallons per hour. This efficiency is possible because she’s a displacement catamaran rather than a planing cat. Ion’s top speed is about one half that of a planer. Another penalty of the displacement catamaran is its limited ability to support payload. Thus light construction and limited amenities are requirements of the small displacement cat. The accommodations on this boat are a little like that on a space craft. The boat has to be light and aerodynamic. Weight, weight placement and judicious use of power are important considerations. Light construction and limited amenities limit the Ion’sweight for optimal performance. Blackwell Boats in Wanchese, North Carolina, custom built this boat for me. 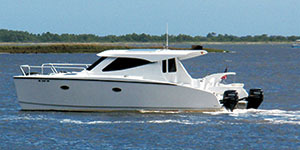 This diverse boat builder has built Sport fishermen of their own designs up to 72′ as well as a variety of sailboats. Their forte is lightweight construction. Craig Blackwell, originally from Bay City, Michigan, worked for Gougeon Brothers Inc. as a boat builder when he was a young man. He eventually went south, starting his own business that proved very successful. Blackwell mainly builds with Core Cell, E-type biaxial fiberglass and WEST SYSTEM® Epoxy. These are the primary materials used in Ion’s construction. The core was shaped over forms and then the fiberglass was hand laid over it. Later, when off the forms the interior skin was covered with fiberglass. Many of the panels were built on a flat table. Ion’s roomy main cabin. 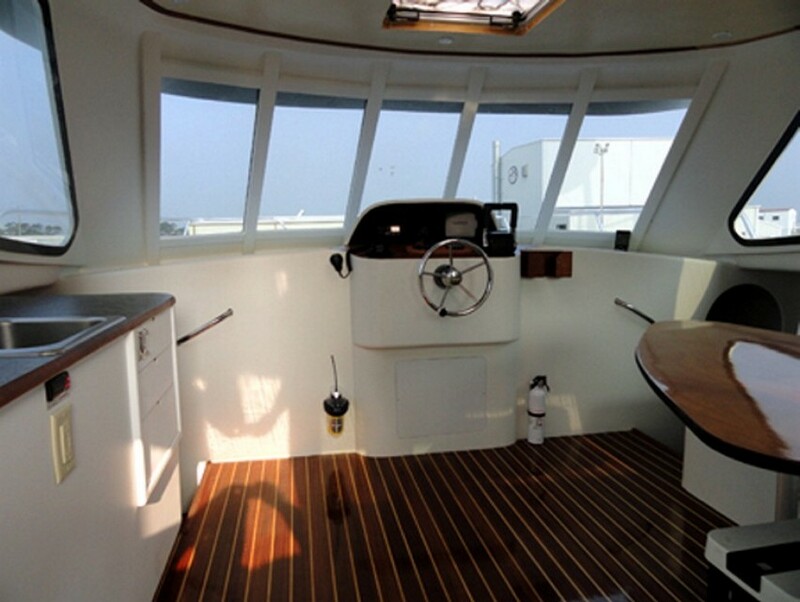 The instrument panel and hood and the table were built by Watson in Bay City and installed in the boat as construction progressed. Separate fuel, batteries and electrical for each engine provides redundancy, improving Ion’s autonomy. Except when docked, she runs on DC power. Two 100-amp batteries are dedicated to start the motors. The house battery bank consists of 300 amps of stored energy. All lights are LED. Renewable energy production is harvested with a 400 watt polycrystalline photovoltaic array. The galley stove, sea swing, barbeque grill and on-demand hot water heater all run on propane. The boat is propelled by twin Yamaha 90 hp, four-cycle, gasoline engines. These quiet motors permit normal conversation on the aft deck when running at speed. At idle, you cannot hear them. On the bow of the craft all you can hear is your apparent wind and the rush of the water as the hulls pass through the sea. Each motor weighs 369 lb and produces 25 amps for charging the start batteries. The craft can be controlled in any direction with the throttle. This excellent maneuverability stems from the wide spacing of the motors. Ion can turn on her centerline and spin 360° within her length. The motors are not counter-rotating, but slender hulls and skeg work account for good tracking. The holding tanks, fuel tanks and potable water tanks are composite built. The rowing dingy, Atom, is a 60 lb, stitch and glue epoxy/ plywood 7′ 6″ long Sabot design built from plans by Glen-L Marine. The dinghy fits between the hulls, stored in davits that I wrote about in the previous issue of Epoxyworks. Ion has everything I wanted in a retirement cruiser. 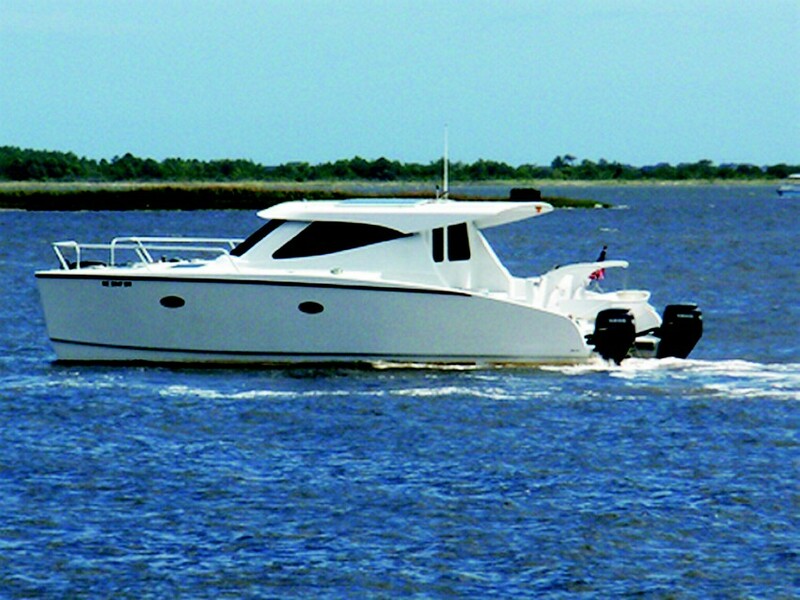 This entry was posted in Boat Construction and tagged 33, Craig Blackwell, Epoxyworks #33, Fall 2011, Ion, J.R. Watson, outer banks, Retirement Cruiser on May 31, 2015 by ewadmin.